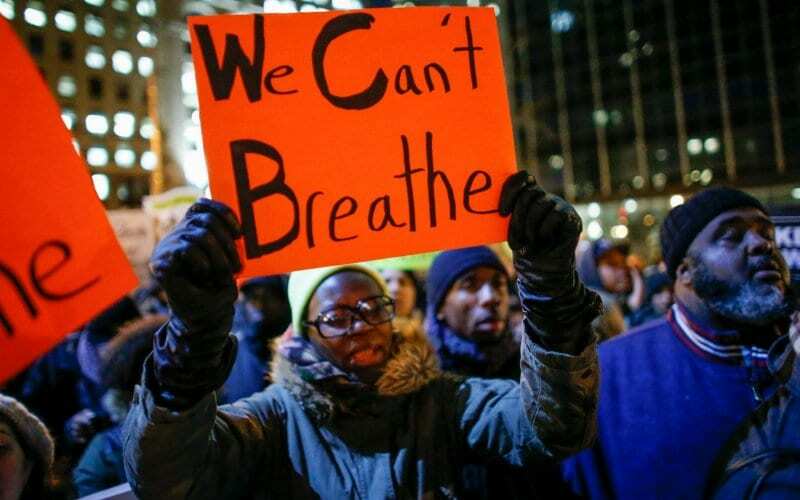 Protesters across the nation swarmed city streets late Thursday to voice outrage and their demands for police and judicial reform in the wake of Eric Garner’s death and the refusal by a grand jury to indict the officer who put a chokehold on him. From One Police Plaza in New York City to Oakland, Calif., and from Chicago to Savannah, Ga., people unhappy with the lack of an indictment in the July death of Garner, 43, stopped traffic and staged “die-ins” in which groups of people lay down on sidewalks or floors. The protests were mostly peaceful. Protesters shut down rush-hour traffic on the Brooklyn and Manhattan bridges, chanting and holding signs bearing slogans such as “Black lives matter” and “hands up, don’t shoot.” In the end, the New York City Police arrested at least 200 people in the protests. Protests also took place outside the Staten Island Ferry station, which was shut down for the night. Other cities where protesters took to the streets included Dallas, Washington, D.C., Louisville, Ky., Cincinnati, Detroit, Indianapolis, Minneapolis, Wilmington, Del., and Asheville, N.C. This entry was posted on December 5th 2014 at 8:29am/08:29 and is filed under Live News Column 1. You can follow any responses to this entry through the RSS 2.0 feed.